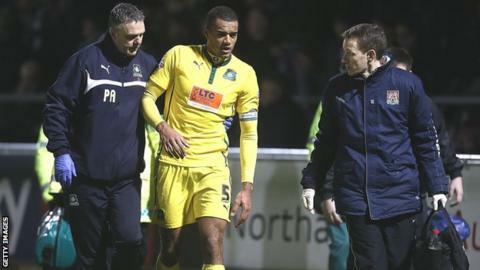 Plymouth Argyle captain Curtis Nelson could be fit enough to return for the Boxing Day trip to Newport County after dislocating his elbow last week. "He's been out running this morning and touch wood the injury's not as serious as we first thought," manager John Sheridan told BBC Radio Devon. "It's getting easier day by day so we'll assess him." Nelson was hurt in the closing stages of Saturday's 3-2 win at Northampton Town but scans showed the centre-back did not suffer a fracture and did not require an operation. "Curtis wants to get back playing, but we've got to respect he's had a bad injury," added Sheridan. "Luckily it's not come out as bad as we first thought. "It's down to the medical people and we've got to make sure that if and when he does get back he doesn't have any reaction from the injury."